Bill Brown's Dream Whip zine is a raw little chunk of America, full of darkened crop-fields and desert moonlight and sad, empty diners. In its 14th issue, Dream Whip is a zine with some history behind it. "I was skateboarding one night, back in early '90s," Bill explains over email. "It was late, and it was cold. I hit a rock and, suddenly, I was lying on my back and the sky was full of shooting stars. I was dizzy for a year. I started doing a zine to take my mind off my broken head. 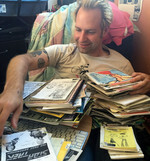 I finally got better, more or less, but the zine kept going." The long-running Dream Whip is an informed, articulate, patient piece of existential storytelling. In a tone that's half Ira Glass, half Cometbus, Bill's 344-page pocket-size 14th issue gives us stories of biblical theme parks and border-crossers, of Dutch punks and haunted houses. 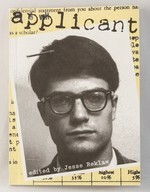 His is a wide-spanning, optimistic, Technicolored America, more Woody Allen than Kerouac, but always on the road. As says Bill, "Dream Whip is a bad country song full of open roads and achy hearts and ratty motel rooms where I take stock of how many miles I've gone and how many I've still got to go." "Driving and sleeping. Sleeping and driving. When you've been on the road for a while, you can't really tell the difference between them. Even when you're not moving, your body is buzzing. Bill Brown talks about this and other traveling truths—like how the epic lateness of Amtrak trains alters your perception of time—in his new mega-issue of Dream Whip. Brown has been publishing accounts of his travel adventures in this zine since 1992 and I've been reading it since somewhere not too long after. He, like other favorites Aaron Cometbus and Al Burian, has a traveler's spirit. A kind of endless patience for anything that may or may not happen (including waiting 12 hours for a train in the middle of nowhere) coupled with a joy for life's simple pleasures (like staring out train windows, late night truck stop coffee and pie, riding around on bikes and buses, etc). Brown is funny, insightful, and romantic. At the beginning of a freighter trip across the Atlantic, he describes the first night in his room: "My cabin has a bed and a couch and a coffee table that's bolted to the floor. Those bolts worry me. They mean there are days on this ship when the furniture needs bolting down. I slept on the couch last night. Maybe that's out of habit. Maybe because I'm more comfortable on couches...I consider sleeping on the couch every night, like I'm couch surfing across the Atlantic Ocean. That's a couch surfer's dream, after all, catching a ride on some couch that'll take you around the world, like some slacker Magellan, mooching a circumnavigation." So good!" “ … You could call this a travel book but as I went through it, I thought of if as a chance to go around the United States and into the depths of England, France, Italy, Germany, Austria, Slovenia and Croatia with a scintillating companion. Brown is one of those travelers who will put up with anything: being a sponge on friends, being ashamed of being a sponge on friends, waiting for Amtrak (five hours late), riding a freight barge from Detroit to Canada, living in seedy noisome hotels, motels, and cars. … Dreamwhip 14 is an odd duck. It’s a fat square volumn, written by hand, in capital letters, the way I started writing when no one could read my child scribbles. It is another of these self-published (or nearly self-published books) that fill the mail box so that you want to scream. But this one catches you right off. It has a gentle air about it, a slightly worn, existential feel of toleration for all the pains of travel, telling us of one who is self-sufficient, is willing to hang out in places no other travel writer would dare to go to. And then, when Brown finally gets to someplace like Vienna that everyone else loves, he notices that it is dead, and that the delicious thick black coffee probably bubbles up from underground, but it doesn’t add any life to the place. It is, apparently, worse than Phoenix, or Toledo, or even ridiculous Carlsbad, California. 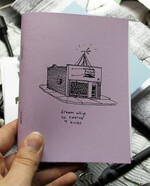 "While it does include a lot of lines such as "[t]he wind has stopped taking its meds again," Dream Whip has the conviction of a long-haul lifestyle, a zine that will run out of material when its creator dies, a zine that's logged 14 issues with no problem, a zine that no longer depends on its influences. Is has the sweep of a first novel, dozens of anecdotes in which I lost myself, and a disarming wit that Cometbus lacks. It's one of my favorite Cometbus replicas I've read, even if it can't escape that comparison. Check the cute World Trade Center séance drawing, and stick around for the index. " 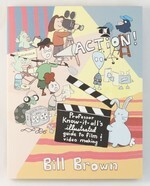 "Bill Brown is fast becoming one of my favorite writers slash artists. His writing is modest; on the surface monotone, but the imagery is intimate, mesmerizing, and at times compelling. He wavers between his observations of the world around him, and the commentary of his inner voice, which retains a childlike perspective that is fresh, gentle and poetic even when looking at things that are not. This "zine" is a 344 page pocket-sized paperback, full of tiny, handwritten chapters, many titled after the places he travels. In Wendover Utah he builds a bike that glides over abandoned railroad tracks. In Border #2 he travels with volunteers who leave water caches and look for people in trouble in the desert. In Eureka CA he observes an attempt to barter some Humboldt export for a corn dog. The dozens of ultra-short chapters make it easy and convenient to enjoy as many or as few as suites you in a sitting. Although it's all grown up into a book, this is still a wonderful little perzine that's as intimate and creative as anything out there." " ... Brown is just so likeable. He's not elitist or ignorant; he simply loves the world around him." I love, love, LOVE this zine for all the reasons everyone else listed here. I hope he sticks with the little book format, rather than the rubber bands because it makes it so easy to take with and then add to my bookshelf. I also hope that he decides to have an omnibus of #1 through #13 published, as well. 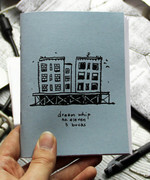 Its name and content reminiscent of Cometbus, Dream Whip is a collection of Bill Brown’s mini travel stories and essays. 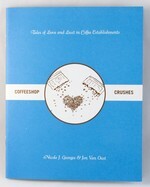 And also like Cometbus, each story is a little treasure, packing wisdom, heart, and humor into a couple of paragraphs. This bound zine is a breeze to read through, even at 330+ pages, thanks to its small pocket size, large handwriting, and effortless ability to draw you in. Read it with wanderlust and a goofy smile (and don’t forget the funny index!). I first came across Dream Whip, through its tenth issue, when I was living in my parent's house in small town Maryland. This was six or so years ago, during a time when I was embarking on my first significant road trips, and Dream Whip fueled my daydreams of exploring further than Philly, New York or Toronto. 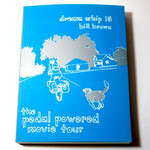 I wanted to go west, as Bill Brown does, in his seemingly endless voyages throughout the U.S. I still haven't made it west often, and both times on a plane, a mode of locomotion Brown seems to avoid. Instead he opts for his car, bikes, buses, trains, ferries, and ships when traveling to Europe. And as I did as a teenager, I indulge my wanderlust with his meandering tales, as the destination, for Brown, is often of lesser interest than the trip there. Like previous issues I've encountered, issue fourteen is a thick, squat, hand-written affair, illustrated with Brown's delicate line 'portraits' of roadside motels, signs, train depots, and evocative buildings. Also included are comics accompanying the text, but fewer than before, as I recall. Other important differences are the cover and price: issue fourteen is bound in delightfully-textured card stock and costs ten dollars. Also included is a quirky index that captures the spirit of Brown's topics in a few choice, intriguing words (i.e. machine guns, hippy kids armed with; film projectionist, soviet-era; and skin rashes, patron saint of). The price hike is more than justified, as Brown's zines are packed fuller than many a book, this one clocking in at 336 pages, not including the index. Also, it's much easier to handle than previous issues, as those were secured by a fat rubber band that did little to prevent pages from slipping and curling. Brown's musings are free of chronology for the most part (aside from his trip to Europe), structured only by place-related headings. In less capable hands, the writing could feel disconnected, but Brown's cohesive perspective and voice hold it together well, making Dream Whip a smooth and fairly quick read, despite its length. Fans of the long-running zine Cometbus should be sure to check Brown's work out, as should those who enjoy urban exploring, roadside americana, alternative histories, and well-crafted memoirs. I should just get off my duff and write Bill Brown the fan letter I've been meaning to write him for years,. I was reading Dream Whip on the train today and thinking about Bill Brown and Al Burian, and how I'd happily read about the aimless travels of crackpot smart men for...well, how long you got? Remember Big Little Books from when you where a kid? This book is what I the size and shape of those books. At least it is what I remember those books being. Because it is #14, I am guessing this is one of those things that fits somewhere between a zine and a book. This is a great little book that is to travelogues what Microcosm's Zinester's Guide to Portland is to travel guides. Bill Brown shares stories and insight as he travels across the United States, his trip on a freighter to Europe and eventually tales from Europe. I especially enjoyed the stories of when he was on the freighter. The writing flows naturally and you certainly feel as if you were along for the adventure. For a small hand written book it is dense, running at 336 pages, it takes a long while to get through it. But, it is the kind of book you don't want to stop reading. I unfortunately doubt that I will ever travel to Europe via freighter or travel to Croatia, Italy and the places Bill describes, but his descriptions are so clear and so matter of fact, I feel like I already have. Having been a fan of this zine for a while, I knew it would not disappoint, despite it also having graduated to a perfect-bound paperback form. Bill’s words are like fibrous lengths of jute, and he threads them around and through your mind until you’re all bound up in his sprawling travel tales. He’s quietly opinionated, and although he never divulges too much of himself, by the end of his stories he’s dropped enough strategic hints that you get some kind of picture of who he is. Maybe it’s not always the same portrait, but I think it’s probably pretty close. Straightforward, calming yet wistful prose that reads well under a big cottonwood tree in the waning afternoon light, or anywhere, really. The tales are interspersed with Bill’s little descriptive drawings. Highly recommended! 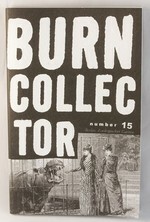 DREAMWHIP ranks up there with BURN COLLECTOR as one of my favorite voices in the small press. 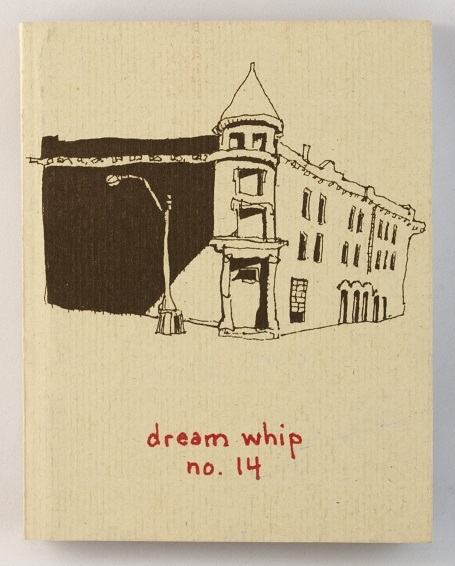 Bill Brown's Dreamwhip #14 is a travel zine in book form. I'm in love with this little book. Furthermore, I have no idea how I've missed the previous thirteen issues of Bill Brown's zine. I have some catching up to do. While initially flipping through Dreamwhip, I was instantly charmed by the illustrations, including painstaking sketches of train stations, motels, and diners, and amusing cartoons. The index was also promising, with entries such as "corn dog, as trade for pot" and "jacuzzi, trucker" and "skin rashes, patron saint of." I read Dreamwhip in two sittings, because I couldn't bear to put it down. I also read at least half of it out loud because I just had to share it (Sorry Cam). This book is, to say the least, right up my alley. Bill seems to appreciate inhabiting dusty little corners of the world a little longer than most people would prefer, and is able to convey an engaging combination of humor and loneliness. If that sounds bleak, think again. The result is often laugh out loud funny. I was tickled by Bill's fear that a friend's cat considered him a mooch. "Of course, it takes a lot of nerve for a pet cat to be calling anyone a mooch, but that's beside the point." Another highlight was Bill's illustrated account of a visit to a haunted house in Illinois that had me laughing so hard that it was difficult to read aloud, and simultaneously wondering if a trip from Reno to Illinois simply to go to a wacky (and possibly dangerous) roadside attraction is impractical. That story alone is worth the price of the book. Get this! Technically, this is a zine. But it feels like more of a book. A book that is 1/4 sized and has large type. It sort of made the 300 plus pages in it go a lot faster and made me feel like a bit of a speed reader. So take that, those critical of my slow reading style! All that aside, I have heard of, but never actually read, Dream Whip. I really enjoyed it. The writer details numerous short stories, little anecdotes, nuggets of wisdom, and tiny life lessons wrapped around the theme of traveling from the Southwest, to the East Coast, over to Europe via cargo ship, through the old country, and back to the U.S. over the span of who knows how long (though I'm guessing it's a little over a year). It makes me want to wantonly travel again with no real agenda, and no real timeframe. Along the way there are little illustrations (mostly of motels, cafes, and architectural oddities), as well as some rather humorous strips. In the end, he ends up taking residence in Detroit of all places. But the general theme of traveling is almost secondary, rather background, to the interesting foibles and stream-of-consciousness happening on the surface of these tales. An excellent read that encompasses my (sort of) life motto, No matter where you go, there you are. 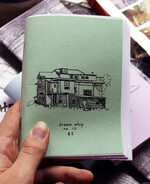 A fat little publication that can easily fit into a hoodie pocket to be read on a train ride, Dream Whip is a travel-story focused personal zine. There are a few dozen tales of adventure in Europe and North America. The layout is simple and easy to read--mostly text with a few illustrations and newspaper clippings thrown in. 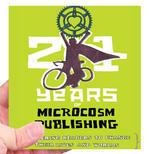 The writing itself flows well and avoids the usual pitfalls of personal zine-dom, resulting in a decent easy read. More than a travel guide, [Dream Whip #14] sets out the ways in which experiencing different cultures can have an effect on your belief systems and make you question your own ideologies. This little book is mostly a collection of travel and couch-surfing stories through weird little towns and a few big cities in the US and Europe. Written not too personally, and really pretty hilariously, it's a zine that does service to weeks-long boat trips and one-mans haunted house by not over-inflating their uniqueness but just telling the story as it happened, which makes everything a lot funnier anyway. It's occasionally illustrated, largely with line drawing of houses and bus stations, but there are some good comics too. 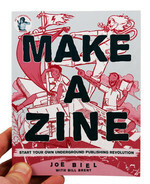 Overall it's really well written, and this is seriously a great zine.